If something, then this is a belated post. Prolog was the language of July and now it’s September. Anyway, before I completely fail, let’s just wrap it up and go on the next language with this one month hiatus in August. During two months, some additional resources did show up. A dear commenter on the previous post recommended me the following book: Richard O’Keefe: The Craft of Prolog. I got about a third, maybe halfway through it and it’s interesting, written long time ago in a style that since gone out of fashion, unfortunately. It’s a programming book that is fun to read and one can see that the author is very knowledgeable. Some aspects of the book didn’t age very well, though. The author keeps comparing Prolog to other languages – many of them are not very widely available either. Also, some of the language features are specific to his version of Prolog, that wasn’t the same one I was using. Would recommend, though! This last part, the different implementations of the same language, can be a real problem. Of the three compilers available for me, all of them had specific strengths and weaknesses. Guess they are converging, but not quite yet. So far I was mostly using SWI Prolog, but this might change in the future. The said commenter also recommended a cross-compiler, doing Prolog-to-C magic, for portability and other goodness. Can grab it from here: http://ftp.shaw.ca/irvinsh/prolog.tar.gz I haven’t had time to try it yet, but once I have, I’ll do a comparison. From a friend’s recommendation I was checking out a site with free textbooks. They are all advertisement-sponsored, which is an intriguing idea (for another post). 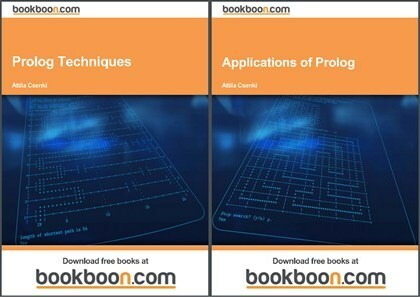 The IT section had not one but two books on Prolog: Prolog Techniques and Applications of Prolog. This latter one has a Hungarian author so I’m even more intrigued, we used to have great computer scientists (John von Neumann / Neumann János, anyone? ), so I hope we keep up that tradition. (Oh, yeah, and had great physicists as well, maybe I can do more on that front later). I was only skimmed them a little bit, but looks like these will be good addition for my “programming for fun and efficiency” library. Will update the original LotM:Prolog page with these links as well. Now onto September’s Language, fortunately I have idea what I want to learn for the next ~3.5 weeks. October will be something Artificial Intelligence related since I signed up for the AI-class.